The finance industry is just one of those industries that’s REALLY difficult to work in as a marketer. You can’t be creative nor imaginative. Your hands are always tied. There’s simply no place for inbound marketing. … Right? If ongoing research is anything to go by, finance is one industry that’s seeing an increasing level of demand for engagement over the internet. From formal customer service to helping people research specific services or just providing some useful and relevant advice. And sure, marketing within the finance industry can be challenging. In many cases, it’s highly regulated and sales can be very complex. But nothing is impossible. With some of creativity, company support, and the bandwidth and permissions to be a little bit gutsy, you can make some serious advances — and the challenge should be embraced as a priority. To help finance marketers overcome these marketing challenges, we’ve put together an ebook tailored specifically to marketers in the finance industry. It covers everything you need to get started with inbound marketing — including blogging, downloadable content, email, social media, and calls-to-action. It also includes a ton of detailed case studies from all types of organizations within the finance industry. 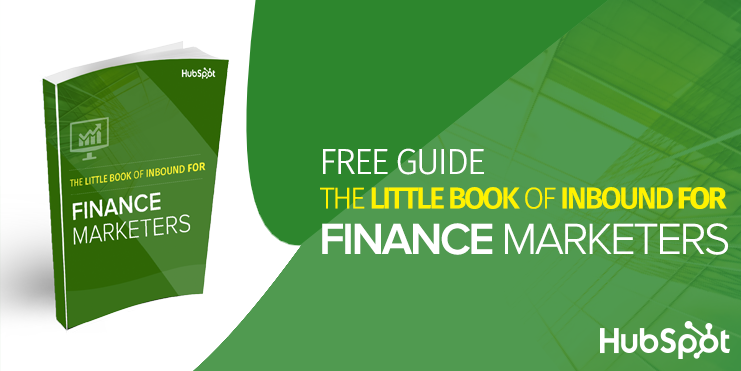 Download your free copy of The Little Book of Inbound for Finance Marketers here. Why blogging is essential for the growth if your business online. One company increased its lead flow by 80%, driven primarily by its blog. How downloadable content can supercharge your lead flow. One company developed an online course that’s had over 10,000 sign-ups in two years. How social media can build your reach online. One company is increasing its social following by around 300 followers per month. How email marketing can be used for more than just operational notifications. One company is achieving consistent lead nurture email open rates of around 75%. How CTAs can bring your lead gen to the next level. One company increased its lead flow by 196% in 6 months by testing different CTAs. Inbound marketing holds a lot of potential for finance marketers in all types of companies, from insurance to banking to investments. Learn how by reading the full ebook here, and take note of all the helpful advice from the finance marketers presented in the case studies.